This page lists every Spider type game in Pretty Good Solitaire and puts them in subgroups of like games. Spider is a popular and difficult game and there are many variations, many of them easier. Aside from the standard 4 deck Spider, Spider type games include Spider One Suit, Spider Two Suit, Chinese Spider (which is essentially Spider with 3 suits), Big Spider (Spider with 3 decks), Huge Spider (Spider with 4 decks), and more. Then there are other Spider type games like Simple Simon, Miss Milligan, Fred's Spider, and the entire Scorpion set of games. See the whole list at http://www.goodsol.com/games/type-spider.html . If you like one game from a subtype, you will probably like the others in the same subtype as well. Games that have pictures are games in the iPad version of Pretty Good Solitaire. A few games have special links under their pictures, these are games that have been featured in past newsletters. We are continually adding more past featured games to the site. What is coming soon? We have updates to the Mac versions of our games FreeCell Plus, Most Popular Solitaire, and Goodsol Solitaire 101 all coming this fall. 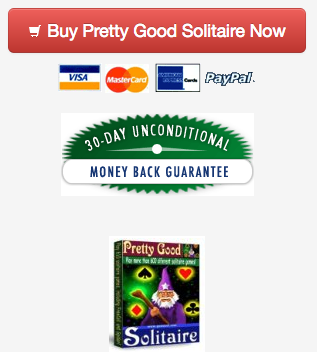 The Mac version of Pretty Good Solitaire has recently updated - see it at http://www.goodsol.com/mac . The Mac AppStore update of Pretty Good Solitaire was just released - it can be purchased at https://itunes.apple.com/us/app/pretty-good-solitaire/id402757468?mt=12 . If you have previously purchased the Mac AppStore version, you can update for free by going to the updates section of the Mac AppStore. 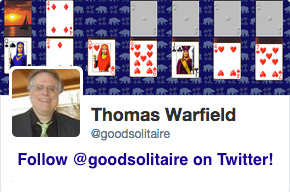 And finally, watch for a new version of Pretty Good Solitaire for Windows coming later in October with 850 games! It's October, time once again for the Halloween Card Set, a card set with Halloween holiday images on the cards. The Halloween Card Set can be downloaded from http://www.goodsol.com/pgs/halloween.html . Both Windows and Mac versions of the card set are available. This game is at Double Scorpion.